I live in a place that’s stunningly beautiful. Abundant with farms, community and people making things. So when you have a crazy idea to put black licorice in some award winning cheese - you say yes. 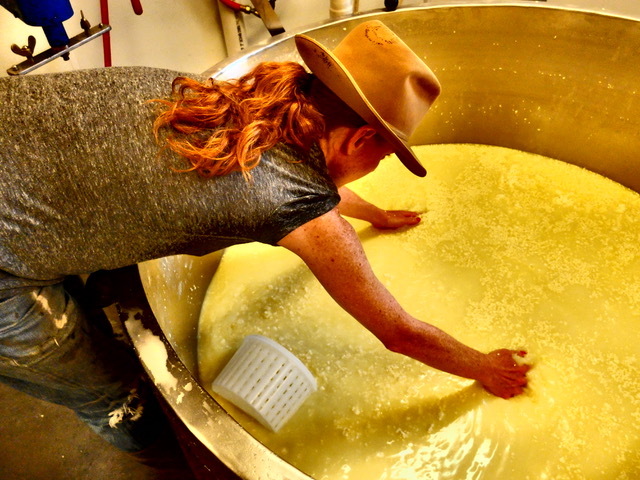 The whole process of cheese making is something I’ve been curious about. So many different types - so many different possibilities! The milk is from the cows standing right next to you - it really doesn’t get much better. I won’t be able to explain the whole process - because honestly, I didn’t pay enough attention to those details. But the patience, process and hands on experience is something that I won’t forget! So, back to our crazy idea. We had a thing for the soft, chewy, panda brand black licorice. How exactly the idea came about to put it in a wheel of cheese - I’m not so sure of. But that’s what we did! End result? Not a keeper! I love cheese - and I love black licorice. Made together in a wheel of cheese? Not so much. This was raw milk cheese which means it must age for a minimum of 60 days. The end result was strange - and I like strange things - so I mean strange in a no bueno way! But wow, that was fun.